Since we had chicken breast and heirloom tomato left over from last Sunday’s Jon’s expedition we baked off a rustic panini roll, spread it with garlic spread, and stuffed it with chicken and tomato. Not as good as when on a fresh baguette, but still pretty tasty for $2.46 per serve. 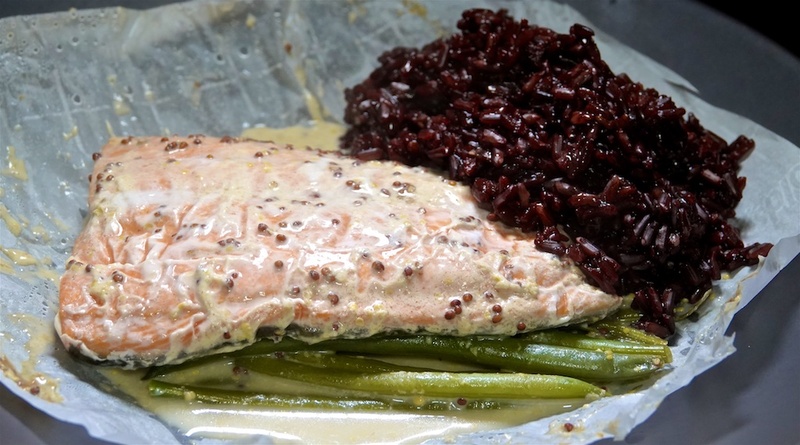 Because it is “fishy Friday” we thawed frozen wild caught salmon and put it in a parchment paper pouch with a generous serve of green beens (haricot verts) and a creamy mustard sauce. 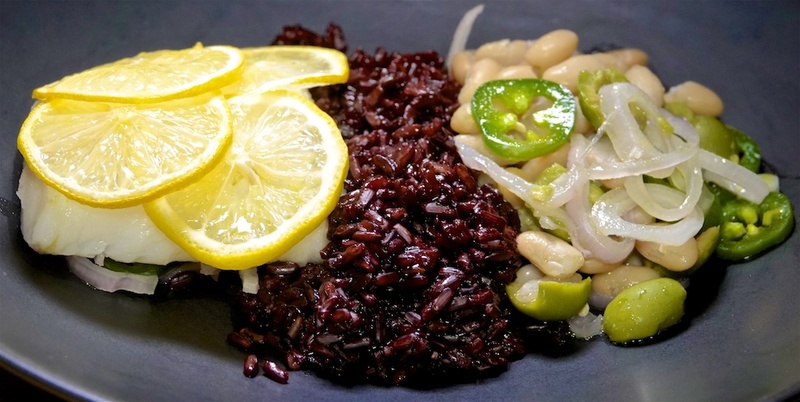 We served it with black rice. Add 50c per serve for the cream fraîche, mustard and other ingredients. Since Foodie Philip was heading past Popeye’s we decided on that for lunch. The Red Beans and Rice is $2.00 per serve. A return to a favorite for $4.69 per serve. Thursday night is our “steak” night and tonight we shared a 10 oz Keller Crafted dry aged Rib Eye! 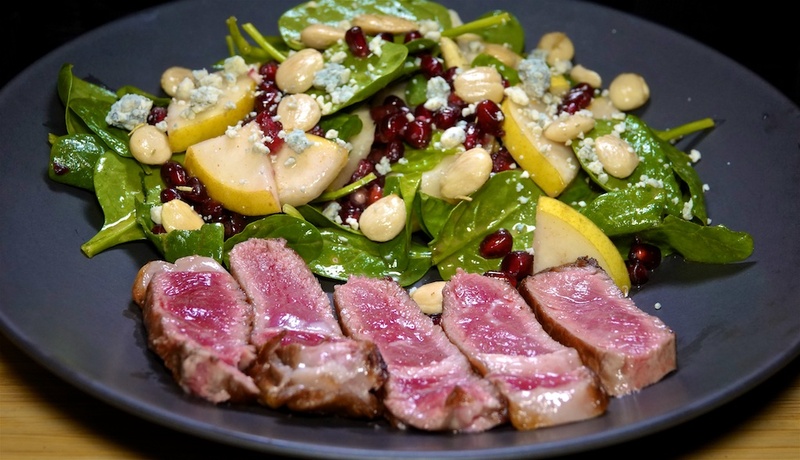 With a spinach, pear, pomegranate and blue cheese salad. Add 25c per serve for dressing ingredients. This is a really good salad that paired well with the steak for $10.35 per serve. For lunch we had a decent, but uninspiring toasted sandwich with sliced turkey breast and Swiss Cheese with garlic spread. Add 30c for butter and mustard. A pair of quite decent toasted sandwiches for $1.72 per serve. Tonight was our monthly user group meeting that concludes with pizza for $10.00 per person. With an avocado ready to go the only decision was what to have with it! We paired it with sliced turkey breast and a new discovery, Sun Dried Tomato Spread, which is like a tapenade with sun dried tomatoes. Add 30c for butter and garlic spread. It could have used a little more salt but otherwise a good sandwich for $1.88 per serve. With two 1 lb packs of dry aged ground beef in our Keller Crafted meat box this month, we returned to an old favorite: Red Wine and Mushroom Meatloaf. We served with roast kabocha squash and stir fried sugar snap peas. The secret to success with this meatloaf recipe is to finely dice the onion and mushroom so they don’t break the structural integrity of the meatloaf. The kabocha squash was $1.93 and we shared half, or 48c per serve. The meatloaf was excellent as always, but unfortunately the Kabocha Squash was dry and very starchy. We won’t be buying them from Ralph’s any more! Otherwise the meal was great for $8.47 per serve. For lunch we used some leftover stir fry beef, which we augmented with some canned mushrooms. The rustic panini roll is 63c per serve. It was an enjoyable, if messy, roll for $2.23 per serve. Being “meatless Monday” Foodie Greg found a Roast Eggplant with Pomegranate and Yogurt recipe. We are generally fans of roast or grilled eggplant and anything with pomegranate seeds, so we had high expectations for this dish. Add 50c for tahini and other ingredients. We were not disappointed. The eggplant became custardy (although the skin provided some fiber) and the balance of sweet tahini, slightly tart yoghurt and some apple cider vinegar was very good. The pomegranate added a tart overlay. A most enjoyable meal for $2.08 per serve. Before lunch we had a shopping expedition to Jon’s market, during which we collected a still warm baguette, BBQ chicken and Heirloom Tomato. We split the baguette, sliced a chicken breast and shared a tomato for a damned good sandwich. Add 20c for garlic spread. Once again proving that great ingredients make even the simplest sandwich excellent as this one was for $2.53 per serve. For dinner we had our regular developer meetup at Gordon Biersch where Foodie Philip had the Smokey Chicken Tostadas while Foodie Greg had the California Beach Tacos. Not a bad meal for an average of $16.59 with tax and tip. The best part of Amazon returns is that they get dropped off near The Country Deli, so naturally we take the opportunity to drop in for lunch. Foodie Greg had a NY Pastrami on Rye, where the pastrami was particularly good this time. Foodie Philip had the marinated skirt steak with eggs over easy and home fries. Lunch at The Country Deli averaged $22.63 for today’s food with tax and tip. Because we had such a big lunch we again chose left overs from the freezer. Tonight we had half of the remaining Pinto Bean & Andouille Sausage Stew. We followed the recipe fairly closely although we substituted a can of fire roasted tomatoes for the fresh in the recipe. We kept it moderately spicy. The recipe makes at least eight serves. Add 15c per serve for spices and seasoning. We treat this dish as a chili, despite being labelled a stew. Despite only half a sausage in each serve (and less bacon) it has a great meaty taste for $2.35 per serve. Since today was “fishy Friday” and we had an avocado we returned to the Avocado and Smoked Trout sandwiches. A good sandwich for $2.87 per serve. Sticking with the ‘fishy Friday’ theme tonight was a return to the Baked Cod with Beans and Olives recipe. Largely because of the olives and lemon, this gets Foodie Greg’s approval because it doesn’t taste strongly of fish. A decent meal for $5.14 per serve. The baked/roasted lemon was particularly good as it still retained it’s citrus freshness but had become quite sweet from the roasting. For lunch we had a bowl of the remaining Cauliflower Cheddar Soup for $2.27 per serve plus the roll, or $2.90 per serve. Thursday night is traditionally our “meat” night where we have a steak or pork chop. Tonight we had a pack of rib eye from Keller Crafted, which we served with stir fry Bok Choy and Mushrooms. Both the steak and stir fry were cooked in our new high tech wok on the induction cooktop. Add 40c per serve for seasonings and saucing. Since Foodie Greg was shopping nearby we had a Bahn Mi from our favorite local for $8.27 per serve with tax. 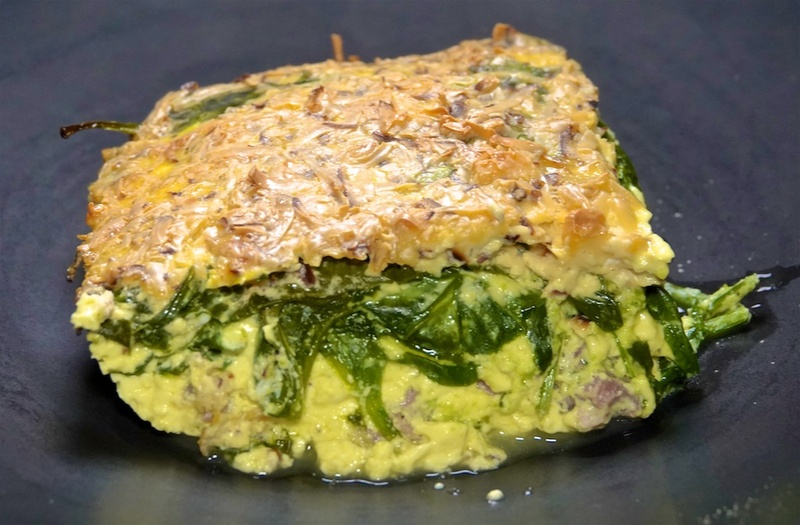 We had defrosted a large portion of last year’s Baked Ham and chopped it into fine pieces, added some wilted spinach and eggs and 45 minutes later had a great crustless quiche. An excellent ‘quiche’ for $2.88 per serve.